Congratulations to Lavonda, our 2018-19 CAR Program Grand Prize Winner! She has faithfully served residents at Magnolias of Chambersburg since 1998! 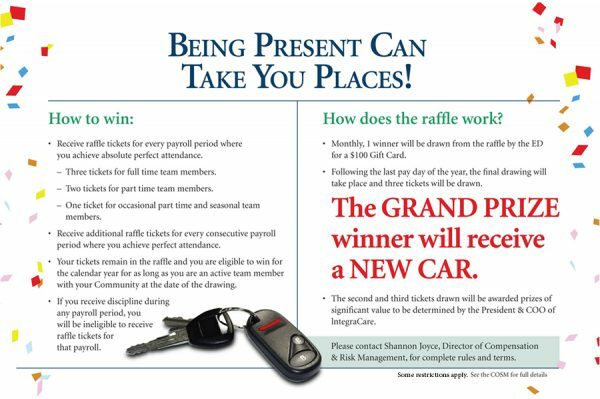 Where coming to work could win you a brand new car! IntegraCare’s CAR Program is a Team Member benefit designed to improve team member satisfaction. By coming to work each day, even when you might be having a bad day, you make a difference in the lives of our residents, and your fellow team members who depend on you. When you come to work on time for each shift, you could win BIG! Each pay-period you achieve perfect attendance earns you chances to win a BRAND NEW CAR or other huge prizes. The longer you have perfect attendance, the greater your odds are of winning! Contact the business office manager of your local IntegraCare community for more information. Join Our Team, Come To Work, and Maybe You’ll Be Our Next Car Winner! Click on your community below to view available positions and apply online.